With this PowerShell script you can add the list item's context menu to any column you want. You'll find the script (AddMenuColumn.ps1) on my Codeplex Project iLoveSharePoint. Let's assume you have a calculated list column called "justAnyColumn" with the following formula "[Title]&[Content Type]"
In this scenario we assume you don't need the title column, instead you want to show the "justAnyColumn" to select an entry. But unfortunately the context menu is attached to the title column. And now?! We could show the "Edit (link to edit item)" column in the view. May be a solution - But our users are accustomed to use the context menu. Well! Now you've got a new column, containing the value of "justAnyColumn" with attached context menu. How to remove the column? Because the column is read only in the UI, you can't delete there. Hi, I thank you for your post. It really saved me a lot of time. I have a question, Can i use your script for a document Library to change the context menu. I tried to use it in a document library and i get the Context menu to another column but it displays "render Error" in the along with the document name in the column. Hi Dinesh, i fixed that. Download the actual script from codeplex. Unfortunately you have to delete the old menu column with the render error. Please use the ID to delete using title deletes first the source column. Find the ID via "$list.Field | format-table Title, AuthoringInfo, ID" The one wit the authoring info "with menu" is the right one. Thanks much for all your help. Your code has helped me and my colleague to resolve a solution for in one of our project. you're welcome. I'm happy for any feedback or idea of approvment. Yours was an excellent post.I have implemented it,but have a doubt.When I try to hide the original justAnyColumn,the text disappears from the justAnyColumn with context menu.How to resolve it .Thank You once again for your post. you're right. I just fixed that. Please download the latest version. Thanks for the quick response,its working like magic! Continue your good work. It works great...and is exactly what we were after. Thanks. One thing is though...When the new LINKED column is clicked (not context menu just clicking the href) we would like to be prompted with the "Read Only or Edit" prompt. I tried changing the onclick event in your script file to call the DispEx()...JS method with no luck. I think you're using a DocLib and want show the default SharePoint dialog. Should be possible. Have look to the MS rendering pattern in the 12\TEMPLATES\XML\field_types.xml and the list definitions in the feature folder for inspiration. Unable to index into an object of type Microsoft.SharePoint.SPListCollection. The error indicates that the list on the specfied web can not be found. The -listName and -fieldTitle params are case sensitive. I used your script and it appeared to work fine until I discovered that it broke the "Export to Spreadsheet" action. The modified column no longer gets exported. All other columns do appear in the resulting Excel spreadsheet. Unfortunately, the case sensitivity does not explain every case where you get the "unable to index into an object of type microsoft.sharepoint.sp..." error. I have encountered a situation where identically referenced (the field title is in Russian, but you can check the referrals are identical; actually I used the "up" key to avoid mistyping the title) indexer calls succeed and fail without any apparent reason. Unable to index into an object of type Microsoft.SharePoint.SPListItem. sorry never had this kind of trouble. Sounds weird. OK, I did some more testing and I find that the error message is misleading here. The <<< indicator points to the wrong place in the error generating string. The problem arises when you actually try to assign an empty value like $null to a lookup. So the message should be "Unable to set null value" rather than "Unable to index...". Hi and thank you ! I have created a custom field and i want to use the same display pattern to add the context menu (in FLDTYPEs_xxx.xml). The menu works but I have an error with the "Show element" option. Have you any idea to add the menu in the XML file instead of use your script. I got everything working, but the behaviour for document libraries isn't 100% correct. In the default context menu, both clicking on the link as choosing the option 'Edit in Word' (for Word documents) would open a popup asking me if I would want to edit the document or open as read-only. Now when I click either of those options, the document opens as read-only in Word and Word doesn't recognize the document is server based (normally a "check-out document" button would appear). Is it possible to alter the command so this becomes possible again? yes it should be possible. Lists and Document Library have a different context menu rendering pattern. Take a look in the Doclib List Definition from Microsoft in the 12 hive folder. Copy the rendering pattern. Could you be a little more specific on what I should replace and where? Could any one help me that how I can remove Edit Item in List Item's Context Menu? I am looking for a solution to link the title column to the document in a document library. any solutions available. Please help! You save my life man, thank you SO much!. Any plans on fixing the AddMenuColumn.ps1 script to work on a SP2010 installation? Actually not, there are many other features I've to upgrade first. Have you try it out with SP2010? I've thought that I've seen something similar in SP2010 out of the box, but haven't found it in SP2010 RTM, maybe I'm wrong. I tried on SP2010... with sum editing but I couldnt make it work. acctually it isnt needed anymore... sharepoint designer made things really easy. Cannot index into a null array. Steve, "Cannot index into a null array" indicates that either the list or the field has not been found. I am still getting the same error message. try to use "Telephone List" instead of "Telephone%20List". Tried it as well. Still didn't work. Any more ideas?? I can confirm that it does NOT work on SP 2010. If you have a chance I would appreciate if you can write the version for SP 2010. Has anybody an idea to modified this script for SP 2010? script works with sp2010, but the new column is empty, is this normal? This rocks, thanks. We had given up on adding the ECB to other columns until I found your complete post. Hi Christian ... Your code is Awesome, it solved one of my major headaches. But i've noticed that when i open in Datasheet View, the Column Disappears?? Any ideas? do you have any clue?? maybe the web is null. That could be caused by a wrong url or maybe your user has no access to the web or no access to SharePoint database. When you run PowerShell scripts the current user will be used for the connection to the SharePoint database. Did you ever resolve your issue. We are experiencing the same thing and after triple checking what I entered, I am sure it is all correct. Hi, -fieldTitle refers to the title (display name) of an existing column. -listName is the title (display name) of the list/doc lib. Anyway, I've never tested it with sharepoint 2010. Guys, for SharePoint 2010, it's super easy! Read this post, I found it, the first paragraph about turning it on using SharePoint Designer. Quick and easy. Christian, Thanks for your contribution. It has been of great help. Question... do you have a similar script but for doing a 'link to item' instead of the edit menu? I just want to say that this works on Sharepoint 2010 but the calculated field doesnt not show the data when its on display in the list but it shows the data when each row is viewed on the individual item "DisplayItem" view. How do you reference a field via its GUID? year back ,i have implemented in one of the MOSS 2007 project , which works grate. I am trying the same with SharePoint 2010.I modified the file .PS1 file replaced "14" instead of 12 hive. I have implemented it with “Title” column of document library, but the text disappears from the "Title(with menu)" also the context menu does not appear. Where was default “title” has text. 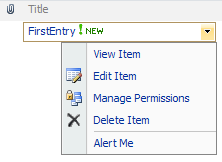 For SP2010: just add ListItemMenu="TRUE" LinkToItem="TRUE" to your fieldrefs. also , i already added these properties to field ref , but text not appears for the column. Any Resolution to Sandeep's issue. I am running into the same thing, no resolution and SP Designer is not the solution. I want to remove the Alertme,Delete items in list item context menu. is there any way when we click on the item in doc library that open in office web apps, and not in display forms. is there any way to open item in Doc library in office web apps, and not in display forms. Thanks for a great article. Your tips are accurate and they will be of great help to me. I bookmarked your site, will be back ! ! Sorry for the blogging absence as the internet connection was pretty bad the last few days during Pope Francis’ visit in the Philippines– crazy, the mobile network providers were actually asked to disrupt service for the security of the Pope. Thank you for the explicit article. Tips you provided us with will definitely come in handy. Hi Guys, I can't find the scrip "AddMenuColumn.ps1" in the link page, could you please let me know wehre i can find it? Thanks a lot!